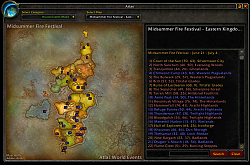 Atlas World Events, a World of Warcraft world events map browser plug-in for Atlas. - Added Harvest Festival map. 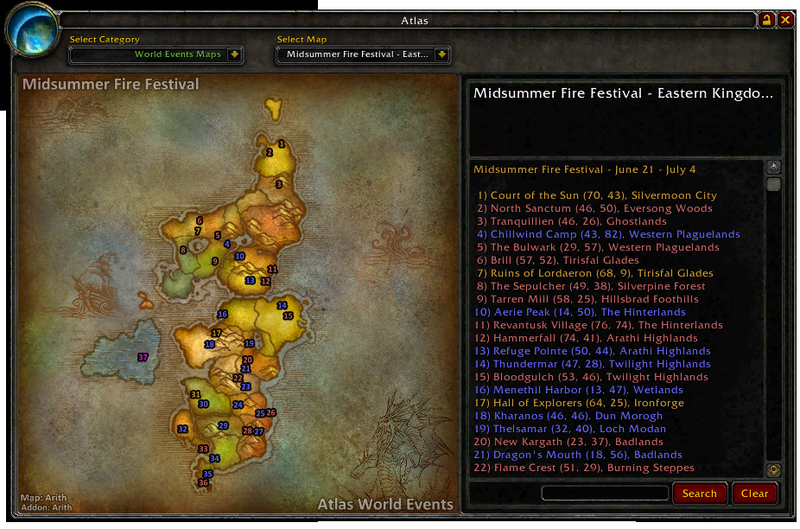 - Added MidSummer Pandaria map. - Update the coming holidays' dates until Feb. 2014. Receiving the following error upon logging in after the most recent update. Sorry, I uploaded wrong version. Please download v3.22 again. Nil value error at 1298 when logging in. Chamber of the Aspects = "Chamber of the Aspects"
Transport: Menethil to Theramore = "Transport: Menethil to Theramore"
Garrison - Horde - Trading Post 3 = "Garrison - Horde - Trading Post 3"
Transport: Deepholm Gunship = "Transport: Deepholm Gunship"
The Grim Guzzler = "The Grim Guzzler"
posted a bug at the WoWI author portal for this addon.